SILAPATHAR, Nov 3 – Four persons of Dimow under Silapathar PS in Dhemaji district America Mili (25), son of Nageswar Mili, Saheb Panging (10), son of Muhi Panging, Baba Panging (25), son of Guleswar Panging and Silsilai Mili (22), son of Bidya Mili sustained serious injuries this afternoon when Arunachalis allegedly opened fire on Assam-Arunachal border. 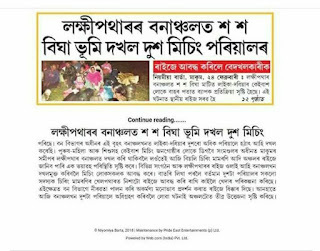 According to sources, the six youths of Assam were returning after bathing in Dimow river at noon, when they were attacked by 40-50 Arunachalis. The sources also added that land dispute problems of Assam-Arunachal are the main cause behind the incident.People of Assam and Arunachal both claimed as their own land although the land is on the map of Sissi revenue block of Assam. Situation is tense in the area even as the culprits have been identified as Marto Nuri, Goa Riba, Tayor Bam and Ibam Riba of Pale Basti of Arunachal Pradesh.Takam Mising Porin Kebang (TMPK) has declared economic blockade in Dhemaji district for an indefinite period. General secretary of TMPK, Johan Doley said that due to the negligent attitude of Assam-Arunachal authorities such incidents have been occuring in the area. He also said his organisation has been demanding solution to the border dispute, but authorities has not taken measures in this regard. He also demanded seizure of the guns of Arunachalis and arrest of the culprits as early as possible, failing which the organisation will resort to agitation.Dimow Regional Students Union has also condemned the incident and criticised the district authority’s negligence towards problems although the disputed land has been declared as under Section 144 IPC. Ngok Mé:lod: The land dispute row between Mising and Galos shouldn't be given a political colour by either side since Mising-Galo are kin to each other.The problem should be solved through discussion among both the Tani people.No side should cross the limit.